Has India seen a foreign policy reset under Narendra Modi? In late 2016 and early 2017, as policymakers and analysts have scrambled to predict the great unknown of Donald Trump’s foreign policy pathway for the United States, it is worth remembering that some 20 months ago, India too confronted a seismic shift in leadership, and faced a future of significant foreign policy uncertainty. Narendra Modi rose to the Indian premiership in May 2014. Like Trump, Modi fits within an emerging global trend of ‘strong’ leaders with hyper-nationalist agendas, including Xi Jinping, Vladimir Putin, and Recep Erdoğan. Upon election, Modi’s image was one of an unpredictable and controversial premier who many thought would substantially change the direction of India’s foreign policy. Modi’s ascent to power also saw the first parliamentary majority achieved by a single party in India since 1984. That party—the Bharatiya Janata Party—was the same Hindu nationalist party that led the country in a multi-party alliance from 1998 to 2004, and presided both over India’s highly controversial nuclear tests, and two significant crises between India and Pakistan. In the same way that analysts and politicians have sought to compute what a Trump presidency will mean for the future of world politics, from 2014 India watchers have wondered how Modi and his party’s leadership will impact the direction of India’s foreign policy in Asia and beyond. It seemed that the mandate bestowed by Modi’s party majority would position him as a powerful national leader with both the authority and the public support to instigate far-reaching foreign policy changes. One prominent line of thinking in the Indian media was that Modi would emerge as a foreign policy pragmatist, discarding India’s principled policies of the past as well as his own Hindutva or Hindu nationalist beliefs. His ‘single-mindedness’ and ‘CEO persona’, which led to the rapid economic transformation of the state of Gujarat during his tenure as chief minister, would likely transform India. India under Modi would take a tougher stance against its long-time regional rivals Pakistan and China. At the same time, his Hindu nationalist beliefs would not substantially, if at all, affect his governance, particularly in matters of foreign policy. Twenty months on from such predictions, what has become clear is that entrenched foreign policy ideas and ideologies within India limit what an individual leader—even a leader as driven, willful, and influential as Narendra Modi—can achieve in seeking to transform India’s foreign policy. A number of factors constrain Modi’s ability to bring about drastic shifts in Indian foreign policy. Some of these operate at the domestic level: the obduracy India’s foreign policy establishment, plodding political decision-making processes, and unresolved state weaknesses that stem from India’s internal political challenges. Others operate at the international level: India’s troubled neighbourhood, a long-standing rivalry with China, and the need to retain and enhance India’s soft power. But there is also a constraint that has been a constant in Indian foreign policy—enduring sets of ideas. Defying the prediction that his pragmatism would lead him to dispense with the ideas of the past, instead, like other Indian leaders, Modi has had to take entrenched frameworks of foreign policy ideas seriously, even in policy initiatives that seem to break with the past. 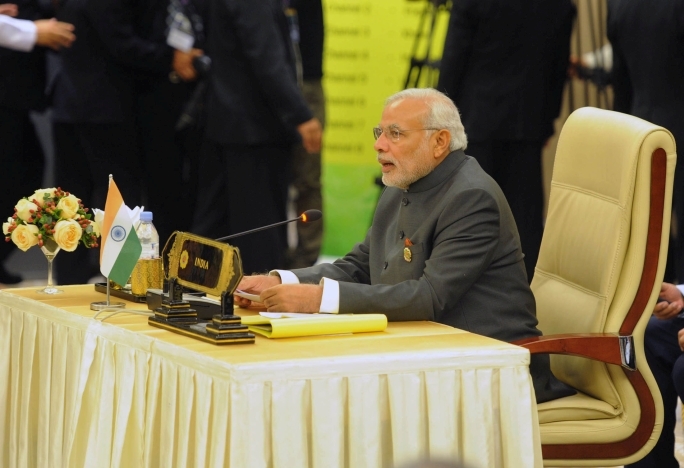 The Prime Minister, Shri Narendra Modi addressing the 12th ASEAN-India Summit, in Nay Pyi Taw, Myanmar on November 12, 2014 by narendramodiofficial. CC-BY-SA-2.0 via Wikimedia Commons. Two cases of apparently ‘transformational’ policy stand out. First, the settlement of the India-Bangladesh territorial dispute through the swapping of enclaves with Bangladesh in August 2015 was seen as a major break with the past. Indian leaders have long held firm to a strict concept of the inviolability of India’s borders. However, they did not suddenly become receptive to the loss of territory or cease to have emotive ideas about the ceding of territory through the exchange of enclaves. Instead, to deflect from criticism that India was ceding territory and to win over opponents to the settlement, Modi focused political attention on the strengthening of the border that his government argued would result from the land boundary agreement, ironically, because of the physical loss of the haphazard pockets of land that Bangladesh and India have each held within one another’s territories. In doing so, Modi accepted the longstanding principle that India’s territory should be inviolable, but also appealed to the Hindu religious nationalism of his domestic political base by linking the border settlement to a crackdown on illegal Muslim immigration. Second, in establishing an International Day of Yoga (IDY) through the United Nations, and then creating a national and international public spectacle out of the first ever such celebration in June 2015, the Modi government again appeared to have made a break from the past. While past Indian premiers are no strangers to the endorsement of yoga, Modi switched gear to champion yoga as one of India’s signature cultural exports. In doing so, he appeared, to some, to be promoting a version of yoga that privileged a narrow, ‘Hinduised’ interpretation of India’s cultural traditions. This move appeared to disregard longstanding, institutionalised ideas about the value and appeal of India’s syncretic cultural heritage. Yet when the Modi government faced accusations that its aggressive and narrow brand of yoga promotion was belying India’s longstanding secular and pluralist identity, it was forced to re-calibrate its approach. India’s ministry for yoga and traditional medicines attempted to avoid—if not include—explicitly excluding India’s religious minorities from India’s first celebration of the IDY. Far from being a leader who could dispense entirely with frameworks of foreign policy ideas, in both cases, Modi’s innovative policy successes were dependent on taking institutionalised policy frameworks seriously, but also on appealing to his Hindu nationalist base of political support. Overall, India’s supposed ‘foreign policy transformation’ under Modi has a narrow space in which to operate. While Modi may have the personal drive to effect changes, and while these changes may lead to some transformative policy successes, his role at the helm of India’s foreign policy is less original and ground breaking than some commentators have supposed. Ultimately, Modi must bring some change to please his domestic political supporters, but the degree or extent of change is limited by India’s institutionalised foreign policy ideas. Those fearful of, or hopeful for, the rise of strong leaders around the globe today and their capacity for radical shifts may find that ideas matter, and that change will be more muted than many suppose. Featured image credit: Delhi India Government by Laurie Jones. CC-BY-SA-2.0 via Flickr. Manjari Chatterjee Miller is an Assistant Professor of International Relations at the Frederick S. Pardee School of Global Studies, Boston University, and a Non-Resident Fellow at the Atlantic Council, Washington DC. She is the author of Wronged by empire: post-imperial ideology and foreign policy in India and China (2013). Her work has appeared in journals such as Foreign Affairs, Asian Security and The Chinese Journal of International Politics, and popular media such as The Hindu, The New York Times and the Christian Science Monitor. Kate Sullivan De Estrada has been Departmental Lecturer in Modern Indian Studies at the University of Oxford since 2010 and teaches the International Relations component of Oxford's flagship MSc in Contemporary India. 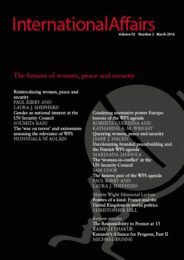 Among other publications, she is the author of ‘Exceptionalism in Indian diplomacy: the origins of India's moral leadership aspirations’ (South Asia: Journal of South Asian Studies 37: 4, 2014) and the editor of Competing visions of India in world politics: India's rise beyond the West (2015). They are authors of the article 'India's rise at 70' published in the journal International Affairs. To liken Modi to Trump is a good indicator of how little the authors understand India or it’s political realities. First, Trump is a seasoned businessman- not a politician. Modi on the other hand has been Chief Minister of Gujrat for over 10 years and has created a track record of largely good governance in his state. An extremely one sided article, the authors have failed to portray a balanced picture.